These esteemed panelists share in common the joys and challenges of being successful women executives leading life-changing non-profit organizations. Hear these inspiring women leaders engage in discussion about relevant issues and share their leadership journey, lessons learned, and the secrets of their success. 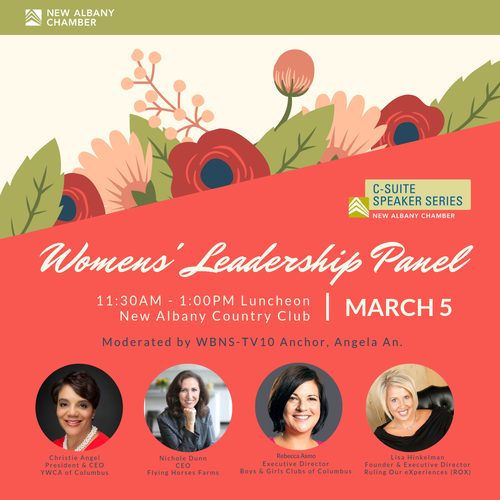 This luncheon series brings CEOs, CFOs, COOs and other C-Suite level executives from leading companies in central Ohio to speak and engage with members of the New Albany business community. These esteemed leaders share insight and wisdom gained from their leadership journey. Be inspired as well as learn actionable leadership ideas, tools and insights you can take with you to your own team.